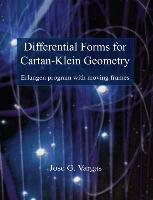 This book lets readers understand differential geometry with differential forms. It is unique in providing detailed treatments of topics not normally found elsewhere, like the programs of B. Riemann and F. Klein in the second half of the 19th century, and their being superseded by E. Cartan in the twentieth. Several conservation laws are presented in a unified way. The Einstein 3-form rather than the Einstein tensor is emphasized; their relationship is shown. Examples are chosen for their pedagogic value. Numerous advanced comments are sprinkled throughout the text. The equations of structure are addressed in different ways. First, in affine and Euclidean spaces, where torsion and curvature simply happen to be zero. In a second approach, the 2-torus and the punctured plane and 2-sphere are endowed with the "Columbus connection", torsion becoming a concept which could have been understood even by sailors of the 15th century. Those equations are then presented as the breaking of integrability conditions for connection equations. Finally, a topological definition brings together the concepts of connection and equations of structure. These options should meet the needs and learning objectives of readers with very different backgrounds.